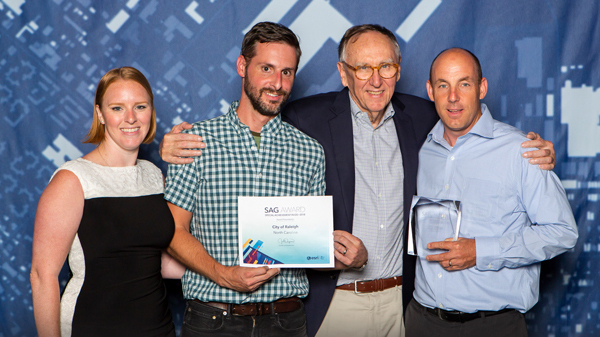 At the Esri User Conference in San Diego earlier this month, the NC State University Center for Geospatial Analytics and City of Raleigh were honored with a joint Special Achievement in GIS (SAG) award, presented by Esri president and founder Jack Dangermond. According to the award website, the honor is annually bestowed on “user sites around the world to recognize outstanding work with GIS technology.” This year, the center and city were one of 175 honorees chosen from more than 100,000 Esri clients worldwide. The joint award between the center and City of Raleigh recognizes their groundbreaking collaboration on Invision Raleigh, which combines state-of-the-art geospatial analytics and an interactive web-enabled visualization system for collaboratively exploring 3-D place-based scenarios of new built and natural environments in the city. Users can explore trade-offs between various scenarios and current conditions, as they experiment with different urban planning alternatives by modifying building dimensions and zoning on the fly. At the Center for Geospatial Analytics, the Invision Raleigh project is spearheaded by Faculty Fellow Perver Baran (Dept. of Parks, Recreation and Tourism Management), research assistant Makiko Shukunobe and doctoral student Reza Amindarbari. Congratulations to the whole team for their achievement!